Enjoy the pool & spa after a wonderful day wine-tasting. Open the double french doors to the cascading waterfall or cozy up to the outside fire pit. Comfortable, quiet and relaxing. 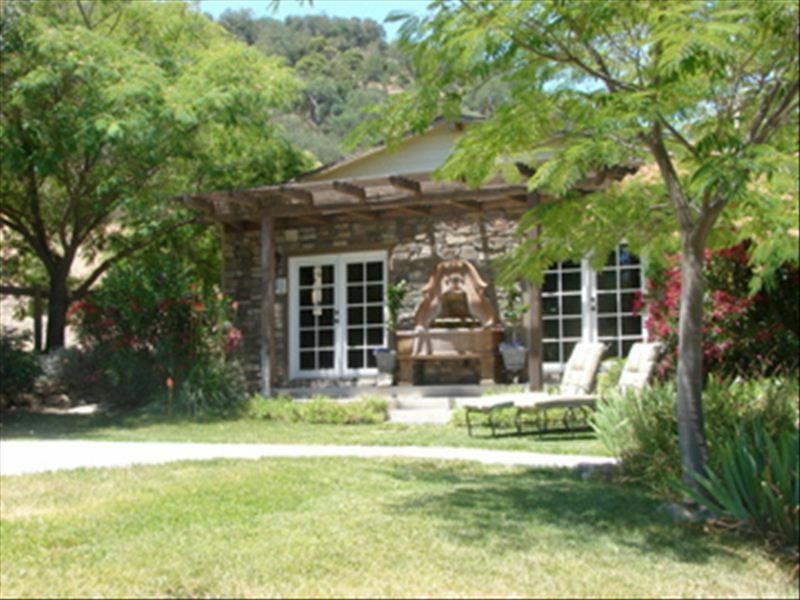 This guest house is adjacent to the main house, both sitting on 10 acres rolling hills. It is private and detached, with its own entrance and driveway. Children Welcome. Bungalo sits in close proximity to pool, so children should be pool safe. My husband Jeff and I love hosting. We love our property, and hope you will too. on the wine loops, on the way to lake nacimiento, rural yet close to town. Lawn area outside unit has 2 chaise lounges for your relaxation. yours exclusively during your stay. pool is adjacent to guest house and main house. solar heated may through september. enjoy the comfortable living rm w 2 sets of double french doors overlooking beautiful pool w/ cascading waterfall. Keurig Coffeemaker w/ STARBUCKS coffee. Outdoor fire pit. Patio farm table . Great central coast feeling. Very nice accommodations just as listed. Nice biking nearby; right in the middle of vineyards and wineries! Renee’s Retreat lived up to all of the positive reviews. A very quiet location just outside of Paso Robles, surrounded by meadows, which was the perfect place to relax after long days at a horse show. The guest house itself has everything you need, very comfortable and nicely furnished. The reservation process was very easy, and Jeff checked in with me on my second day to make sure I didn’t require anything. I thoroughly enjoyed my stay and look forward to coming back. We have visited the central CA coast many times, but usually stayed in Cambria, so this was our first Paso lodging experience. Should have done it so much sooner... Jeff & Renee's place is a perfect launch pad for the great winery & dining experiences the area has to offer. The retreat is very well appointed, Jeff checked in briefly to ensure everything was to our liking, and we thoroughly enjoyed the serenity & tranquility of the site despite the fact that it is so close & convenient to town & the wine area. Looking forward to the next opportunity to come back. We loved it so much we want to give it one star to keep you away! We both work too much and life is hectic. Renee's Retreat was exactly what we needed to get away from it all and have a home base while we enjoyed some wine tasting in Paso. The cottage is lovely and the bed is really comfortable. The little grill outside is perfect and is there for your use. The pool and hot tub in the back yard were perfect for sipping some wine in the evening and looking at the stars out there where there isn't a ton of city lights killing the view like we have at home. We some some small wildlife - rabbits, quail, and falcons on the property. Really, all in all, it was a wonderful place to stay for a couple of days to get away from real life for a little bit. We briefly met Jeff who was very nice and wanted to make sure we had everything we needed and chatted again on our way out. It's really a great place - check it out if it's on a weekend we aren't planning on going up. The bed, pillows and sheets were extremely comfortable. We slept great. The area was really quiet and relaxing. They thought of all your needs (hair dryer, iron, pool towels, etc.) for your stay. When we were checking out the pool and ping pong table Jeff walked out and greeting us and made us feel right at home. It was a great location and not far from downtown and wineries. It was a perfect combination of town and country. Renee and Jeff provided the perfect location for our weekend getaway. My wife and I needed a few days to refresh our spirits and were lucky enough to to find this one bedroom retreat. The property itself is beautiful, the apartment welcoming and comfortable. We loved our time in the Jacuzzi and were lucky enough to meet both Jeff and Renee who were friendly and welcoming. A return trip is in order and we may even bring the kids to take a dip in the pool. Thank you both for hosting us. Above rate is for 2 people. Pets by request only- $ 30. flat fee Bungalow and property amenities (pool, spa, BBQ, patios) are for paid registered guests only. No visitors.